the artist behind Philly-based project Harmony Woods. 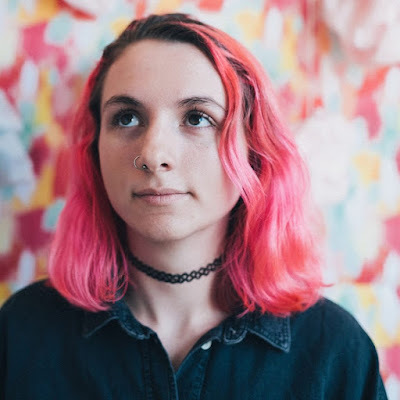 Harmony Woods is the dreamy musical project of Philly-based artist Sofia Verbilla, and their debut LP, Nothing Special, came out May 5th. After listening to the amazing album in its entirety, I can assure you that despite its title, it's actually very special. The album explores the dueling sides of a relationship: the magical beginning and bittersweet ending that we're all too familiar with. But, instead of turning into a dark breakup album, it’s filled with hope and the idea of finding strength in your vulnerability. No matter where you are in life, there are aspects of Nothing Special that will hit you in an almost-too-real way. Whether you're in those fluttery relationship beginnings (“watching you from across the hallway, eyes glued to the floor / suddenly I don’t want to leave anymore” from “Vignette”) Or the “is this really over?” stage of a breakup (“you know how much I love to take care of you/but sometimes I have to take care of me too” from “Renovations”), this album will pierce your soul in a painful-yet-hopeful type of way. I was able to speak to Verbilla about creating the album, channeling vulnerability in art, and her dad's active Twitter presence. The Le Sigh: So the album starts out, and continues to be, super personal and vulnerable, in a good way. Is it hard to share these kinds of songs, or are you excited to let other people into your ~musical world~? Sofia Verbilla: I find it super brave and admirable when songwriters bare themselves and let their true emotions shine through their music, so I tried my hardest to kinda emulate that. I feel like it's important to be upfront about your feelings and unashamed of them. TLS: There is a lot of implications of anxiety on this album. Is writing music how you deal with those kind of issues? SV: Pretty much! Whenever I deal with negative thoughts or feelings I either talk about them or try to process them through writing music. I feel those are the most healthy and productive ways to go about things like that. TLS: I did notice a lot of production similarities between your album and Holy Ghost by Modern Baseball - were they a big influence on you when you were writing this album, and how much were they involved in the process? SV: Jake and Bren have been my favorite songwriters for a little over three years now, so they were a really big influence when I started writing my own music. Bren wrote and recorded all the lead guitar parts on the record, so he contributed to the writing in that sense. As for Jake, he produced the record and he was responsible for a lot of the more lowkey but cool additions to the songs that we hadn't thought about when we had written out the songs full band, such as the keyboard parts. All in all, they had a lot to do with the record, both with influencing it and actually creating it. TLS: Your dad is very active on Twitter when it comes to promoting your music. He seems very supportive and involved in your work, what is that like? SV: OMG! Yup, that's my dad. It's really sick and comforting to have a parental figure who supports your dreams and ambitions 100%. I know it's super rare to have a parent like that, especially in the music scene, so I feel really lucky to have him. TLS: How does it feel to be a female-identifying artist in a space so occupied by men? Do you have any plans to work with other female artists? SV: When I first started writing music and playing shows, I was under the toxic mindset that everything was a competition and that I had to be the best at what I did or else no one would bother supporting my creative endeavors. Now, I realize that the music community I've grown within is less about being the best and more about lifting each other up, which I really love and appreciate. It can be hard being the only band with women members on the lineup, but I would rather us play than have zero women on the bill. As for working with other women in music, my friend Olivia has a really sick project called Major Pursuit and we're starting a new band together once she moves to Philly for college in the fall and I'm super stoked about it! TLS: Where do you want to go from here? In the next month/year/decade/eternity? SV: After the record comes out we're playing some shows close by and then we're going on tour in July, which I'm super stoked about. After that I'll keep writing and hopefully we'll keep bangin' out the tunes! Everything else is pretty much a mystery, but I'm very much looking forward to the future. TLS: Who's your favorite female-identifying artist of the moment? SV: My favorite female-identifying artist is definitely either Mitski or Julien Baker. They're two of the most talented humans on this planet and everything they create just completely floors me. They also both seem like genuine, kind people as well, which is always refreshing. TLS: What is your *dream* gig? SV: I have an inside joke with myself about going on an arena tour with Paramore someday, so that would be pretty sick. Brand New Eyes 10 year anniversary tour maybe? I would literally pee my pants. TLS: Finally, tell me about any of your pets. I’m just curious. SV: OMG! I have two beautiful angel dogs named Jeffrey and Kona. Jeff is a German shepherd mix and Kona is a tiny pitbull/boxer mix. Jeff is the cuddliest boy ever and Kona won't rest until she gets to lick your face. They are my babies and I love them with my entire being. Listen to Harmony Woods on bandcamp. Nina Braca is a SUNY Purchase graduate and writer from New York who loves Oreos and music. She is currently an editorial assistant at Gurl.com and also write for Modern Vinyl. You can talk to her on twitter: @oreokitty_.